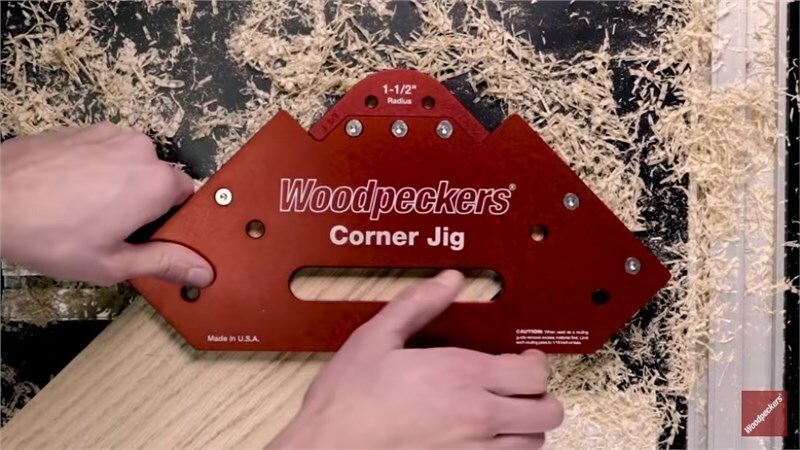 Being woodworking industry experts for over 30 years, Woodpeckers: Precision Woodworking Tools in Strongville OH understands the value of investing in high quality manufactured tools. Since its inception in 1988, Woodpeckers has developed its expertise by demonstrating tools at US woodworking shows. In 1993 they began manufacturing their own router tables, lifts, fences, mounting plates, measuring and layout tools and a variety of clamping accessories. In recent years they have developed a unique OneTIME Tool® program to provide customers with the opportunity to obtain individually machined tools which might otherwise not be available. These tools are offered during a limited time window. Once orders for a specific tool are gathered and the time window closes, Woodpeckers prepares a single production run making enough to fill the orders then retires the product. Like virtually all their tools they are not stamped by the thousands or cast in molds. Each part is machined individually on state-of-the-art CNC equipment at their Ohio facility. 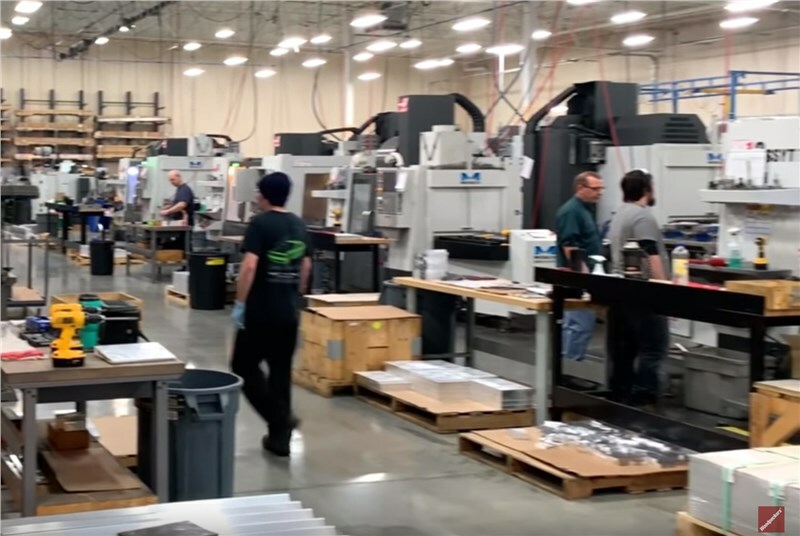 Woodpeckers machines, engraves, assembles and packs all their own products and takes pride in the fact that, from start to finish, their tools are truly made in the USA. In order to provide these tools to their customers, they have invested in high performance machines to do the job. 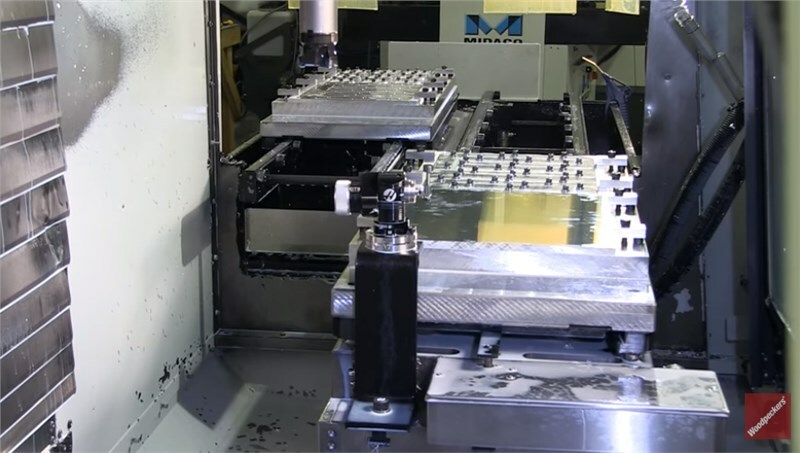 You can see the process of milling their OneTIME Tool® Corner Jig on a VMC paired with a MIDACO Automatic Pallet Changer in the video below. How is it cost effective to run individually machined parts in smaller batches? Simple answer… TIME! Time is not wasted on part change over and the VMC is not sitting idle. 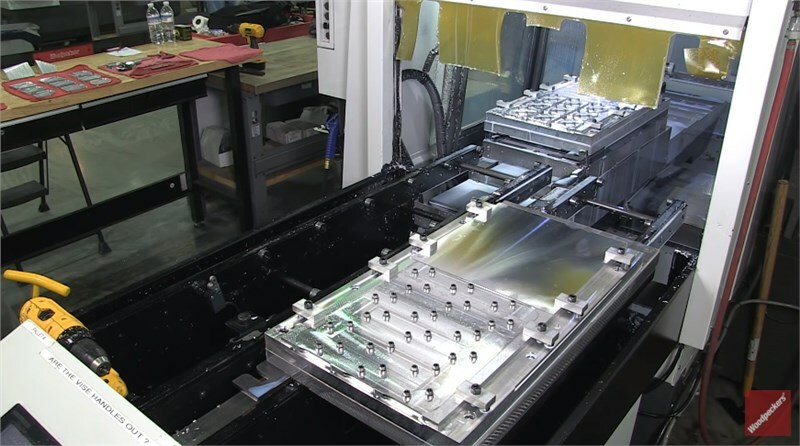 Having a MIDACO Pallet Changer system paired with the VMC allows the operator to load the next batch of parts outside of the machining center WHILE it's cutting. Once the aluminum or stainless steel pieces are mounted onto the pallet, the operator can attend to other tasks or load another machine while the automated program takes over. 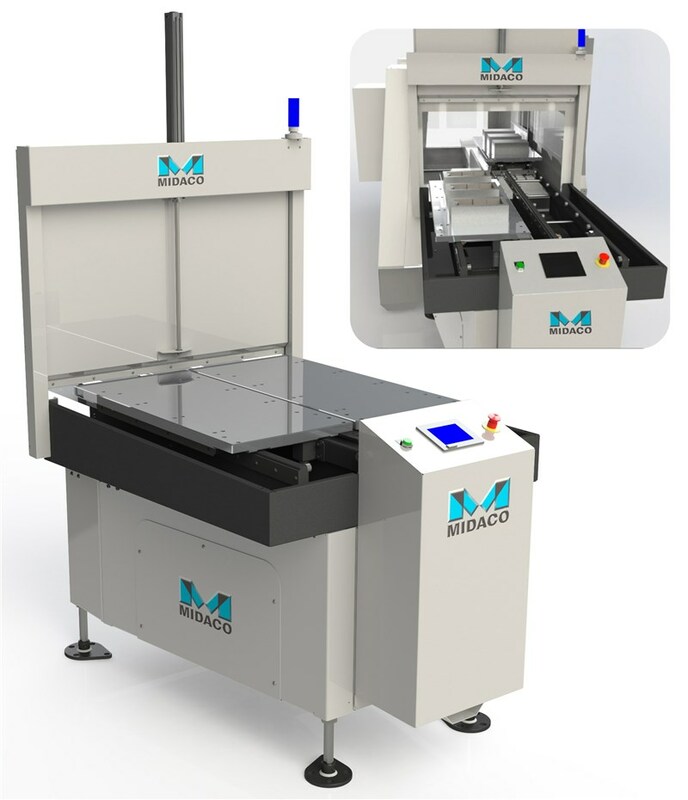 MIDACO's Automatic Pallet Changer is integrated with the VMC control via M-Codes and automatically feeds the next batch onto the machine table in seconds. Automating the part change-over decreases machine idle time and increases its spindle utilization. As a result, projects are completed faster saving time and ultimately saving money. At a conservative shop rate of $75.00 per hour even a minimal 20 minutes per hour down time during an 8 hour shift can add up to over $52,000.00 of lost profit per year (over $4,300.00 per month), per each machine owned. The Automatic Pallet Changer shown is a single shuttle unit with two 40” x 19” (1016mm x 483mm) pallets. This system has an approximate 15 second pallet change time depending on the weight of the parts on the pallets. MIDACO offers Manual and Automatic Pallet Changers from 12.75” x 10.5” (324mm x 267mm) for small machines and up to 190” x 72” (4826mm x 1829mm) and a 32,000 lb (14,528 kg) capacity for large VMCs, bridge mills and machines which don’t move in “Y” axis. All automatic systems are servo driven with a +/-.0001” (.0025mm) repeatability. Adding MIDACO Pallet Changers to their Vertical Machining Centers has been an asset for Woodpeckers in their production of exceptionally machined woodworking tools. The proof is in the time and money they've SAVED. 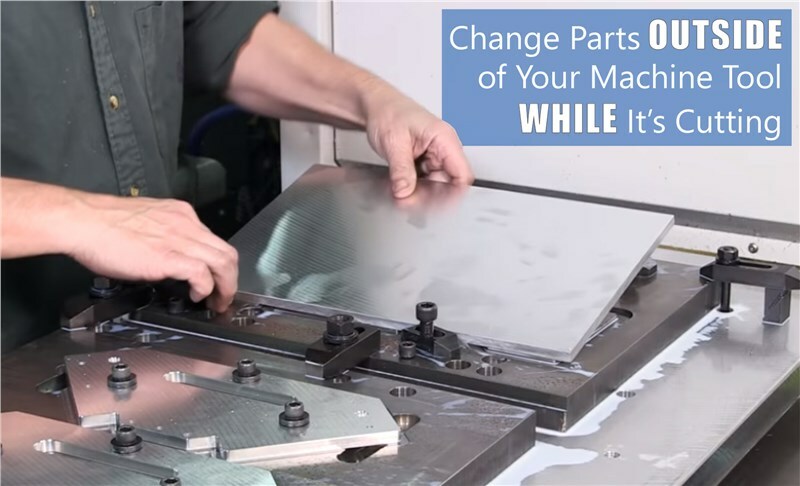 For more info on MIDACO Pallet Changer Systems and other productivity solutions, such as AutoDoor Systems and Trunnion Systems for 4th axis machining on a VMC without cable management, visit www.midaco-corp.com or contact midaco@midaco-corp.com (847) 558-6270.